lthough he missed the feast day of Saint Cecilia by one day (he was born on November 21), music was always a major fact in Calvert Shenk's life. He graduated from Northwestern University in 1962 with a Bachelor of Music degree, and went on to earn a Masters of Music in Organ and Church Music in 1963 from the same institution. He continued his studies with Theodore Marier (Gregorian chant), Gerre Hancock (improvisation) and Sir David Willcocks (choral conducting). He was received into the Catholic faith in December 1962 and in October 1968 he married Ila Marie Connors. 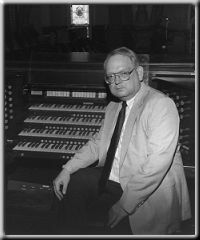 Mr. Shenk worked full-time at various music positions, including St. Henry Parish in Chicago IL, Armed Forces School of Music at Norfolk VA, St. Philip Parish in Battle Creek MI, St. Catherine Parish in Milwaukee WI, Cathedral of Saint Paul in Birmingham AL, as Organist and Director of Music at the Sacred Heart Seminary in Detroit MI and his last position as Director of Music at Assumption Grotto Church in Detroit. He also worked as Adjunct Instructor at Kellogg Community College in Battle Creek, as Music Critic for the Battle Creek Enquirer and News, as Choral Director at St. Philip Catholic Central High School, and as associate director, accompanist and composer-in-residence for the Battle Creek Boys Choir. As an organ recitalist, Mr. Shenk performed throughout the midwest, east and southeast, and performed in 1986 at the American Guild of Organists' National Convention in Detroit MI. Internationally, he presented an organ recital at Eglise Notre-Dame in Douai, France. He also led the Saint Catherine Church Choir on a tour of Italy in March 1987, which included performances in Florence, Assisi and Rome. At Saint Peter's Basilica the choir sang for the High Mass on the First Sunday of Lent, and in the Sala Clementina during a private papal audience. Mr. Shenk was a Fellow of the American Guild of Organists, and served as Dean of the Southwest Michigan Chapter, as Michigan State Chairman, as Professional Concerns Chairman of the Milwaukee Chapter, and as Educational Concerns Chairman of the Birmingham, Alabama Chapter. He maintained membership with the Hymn Society of America, the Church Music Association of America and the Conference of Roman Catholic Cathedral Musicians. His particular interests were Gregorian chant, sacred polyphony, organ performance and improvisation, liturgical ceremony, and the theology of liturgy. In addition to several recordings, Mr. Shenk is published by MacAfee Music and GIA Publications, and has written several articles for The American Organist magazine. He was co-author of the Adoremus Hymnal (Ignatius Press).